Milton Keynes has been awarded £2.271 million by the Department for Transport to repair its network. We are using new technology to help clear the Pothole backlog. We have repaired over 2,000 potholes with this grant funding. MK Highways is utilising new technology through its highways service provider Ringway to help mend potholes on our network. This is a rapid patching technique suitable for use on rural and urban roads using cold emulsion asphalt which is placed into the pothole in the road surface under high pressure. 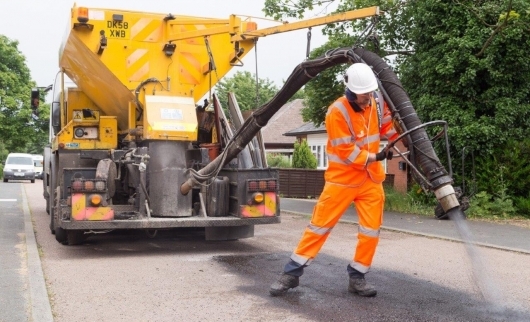 The pothole is first blasted with compressed air to clean the surface and remove any debris, then the surface of the pothole is sprayed and coated with bitumen emulsion. Finally the asphalt is blasted into the pothole, self compacting from the bottom up so requiring no additional compaction. Low carbon footprint compared to using hot asphalt. No excavation so no damage caused to the lower layers. Fast installation so minimal disruption to road users – reduced traffic management costs. Costs around £35 per pothole compared to £70 for conventional repairs. Higher daily outputs compared to conventional repairs = up to 100 potholes per day. Works during colder winter months reacting to potholes as they form. No noise, no dust, no hand arm vibration issues. MK Highways is carrying out visits to a number of villages and estate roads between December 2018 and March 2019. This will contribute to the overall council target of repairing 20,000 potholes and help protect our network in the future.